Will Elon Musk's Boring Company Soon Dig Into Your Garage? 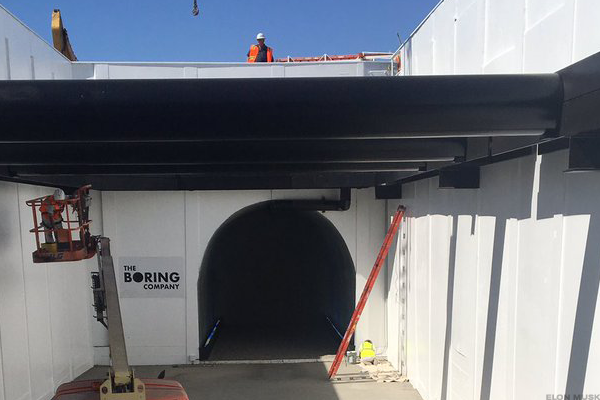 The Boring Company continues to make strides in its tunnel-digging ambitions. Elon Musk is an innovator and a problem solver. Need to send money? How about founding a company that leads to PayPal (PYPL - Get Report) . Need to help solve the world's climate issue? Now we've got Tesla (TSLA - Get Report) . How about finding a way to make rockets reusable and drive down space-related costs? He's got SpaceX -- to be fair, Amazon's (AMZN - Get Report) Jeff Bezos has Blue Origin. Still, it's clear that Musk is one of this century's most brilliant thinkers and most Tesla bears will readily admit as much, even if they believe he's financially reckless. Oh wait, there's The Boring Company. For anyone who's tried to run up to a Costco (COST - Get Report) in LA or heaven forbid a Whole Foods during the week of Thanksgiving, the traffic struggle is all too real. With a residence and SpaceX located in LA, Musk had had enough: he wanted to solve the traffic problems. What seemingly started as a joke has become a really ambitious project as his company literally bores tunnels under the city. The goal is to create a network of tunnels that act as high speed, direct connections between multiple locations. As such, the company is working on multiple tunnel projects in LA, and has projects lined up in Chicago (from downtown to the airport) and in Baltimore/Washington DC. So what does this have to do with our homes and more specifically, The Boring Company boring into the garage? Earlier this year, The Boring Company bought a property for $485,000 in a neighborhood near the SpaceX headquarters. The goal is to build a "spur" off its test tunnel to the property that leads to a 45-foot elevator shaft that goes up to the property. There are provisions in the permit that don't allow for The Boring Company to be too disruptive to current residents. Among other restrictions, this includes an eight-foot brick fence around the property and having an enclosed space where the shaft leads to. It's got some people wondering if The Boring Company plans to tunnel through neighborhoods and into peoples' garages in the not-too-distant future. Is that the future of transportation? While some Musk enthusiasts would welcome such a development, there would be many opposers to such an action. But have no fear, The Boring Company has said this is a proof of concept more than anything else. In other words, the company is simply working on different solutions, looking to create multiple innovative answers to a persistent problem. In this case, it wants to prove that operating in tight urban spaces is indeed a possibility.